No, we haven't stopped providing awesome content for your geeked-out brain - CNN Tech's newest posts have just gotten a new look and a new location. Our redesigned section at CNN.com/TECH has become your one-stop blog for the latest in tech news, including social media, mobile, web, gaming & gadgets and innovation. All of our stories, videos and interactives are now posted there so you can easily access and filter them by the topic you're most interested in. There are a ton of new and continuing columns from Tech experts like Mashable's Pete Cashmore and Netiquette specialists Andrea Bartz and Brenna Ehrlich. Want to know more about what's coming up next in the world of science and technology? 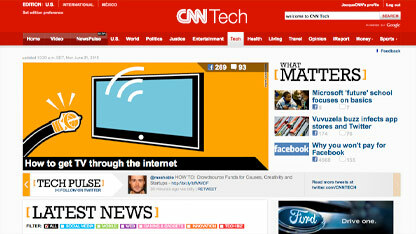 Check out our own John Sutter's weekly innovation piece at the CNN Tech Lab. We've also collected our favorite Twitter feeds and streamed them onto our blog's Tech Pulse so you can keep up with the latest developments without leaving the page. Of course, we still want to hear from the most important people - you. Which is why our Tech page has great user-generated feedback, like Facebook recommend and our ever-popular comment sections. Keep in mind that the easiest way to get all this content is by sending it straight to your computer, whether that's through our CNNTech Twitter account or our RSS feed. So whether you've been a loyal follower of the SciTechBlog for years or are just stumbling upon this for the first time, please head on over to CNN.com/TECH. So, I walked up to a virtual pit. It was maybe 30 feet deep. With a wood plank crossing it. Somewhere deep down in my rational brain, I knew the hole wasn't real - that it was a virtual reality scenario in a cramped office at Stanford University, where the floor seemed completely pit-free until I put on a clunky piece of hardware called a "headmount." But that headmount changed everything. Using a system of cameras, ultraviolet lights and an "inertia cube," the headmount - which looks sort of like a cross between sunglasses and a hard hat - knew right where I was and where I was looking. It fed that info to a computer, which put a realistic virtual display in front of my eyes. The result looked like a video game version of the room I had just been standing in. Only with a big - and really believable - hole in the center. Kathryn Segovia, a PhD student and manager of the Virtual-Human Interaction Lab here, asked me to walk towards the pit and then cross it on the plank. My pulse quickened. I felt the kind of nerves you do before a big drop on a roller coaster, or that tingle in your stomach you get when walking on the roof of a building. Segovia says people have real, emotional reactions to virtual reality. Some become ill. Others fall. And, increasingly, it's becoming apparent that virtual experiences can impact who we are out here in real life. Researchers in her lab, for instance, have shown that people who watch themselves exercise in virtual reality are more likely to do so in real life, she said. And those who watch lifelike avatars eat healthy virtual foods are more likely to make healthy eating choices later. 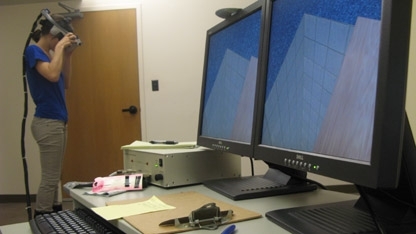 This leads to all kinds of possible scenarios, where virtual environments could be used to help with a person's fear of heights, or help someone with an eating disorder. The real world informs how we design virtual reality, and how we act in virtual realms, she says, but the virtual can also change the real. And it seems the two are becoming less distinct. Back in front of the gaping hole, I walked across the plank without much problem. But I was surprised by how real it felt, how I used my arms to steady my balance and actually worried a bit about falling. Then things got even weirder. In round two of this virtual gut-check, Segovia put other "virtual humans" in the scenario with me - a bunch of concerned-looking men in blue shirts. As they entered through a virtual door, I felt their eyes on me. I started to wave "hello" to them (yeah, I'm that lame), but, much to my real dismay, they started running. Then, one by one, just like lemmings, they jumped into the pit - to their virtual deaths. I actually wanted to try to stop them. But it happened so fast. Segovia, who was controlling this scenario from the outside, and seemed much less concerned about these pixel people than me, asked me to walk out on the plank and look down at the digital wreckage. I steadied myself and walked to the center of the plank, over the virtual hole. I saw a tangle of those "agents," as researchers call computer-controlled virtual people, at the bottom of the pit - splayed out like virtual stew. There was no gore to it, but it was actually disturbing. I wanted to get away, so I scurried off the plank. So fast, in fact, that Segovia had to put out a hand to stop me. I was about to run into a real wall.